British watchmaker John Arnold (1736-1793) ranked among the most eminent specialists in marine chronometry. Established in La Chaux-de-Fonds, Arnold & Son continues to find inspiration in its founder's work. The Constant Force Tourbillon is a technically superlative wristwatch that reflects the eighteenth-century watchmaker's ingenuity. The manufacture movement is equipped with a constant force mechanism and true beat seconds. 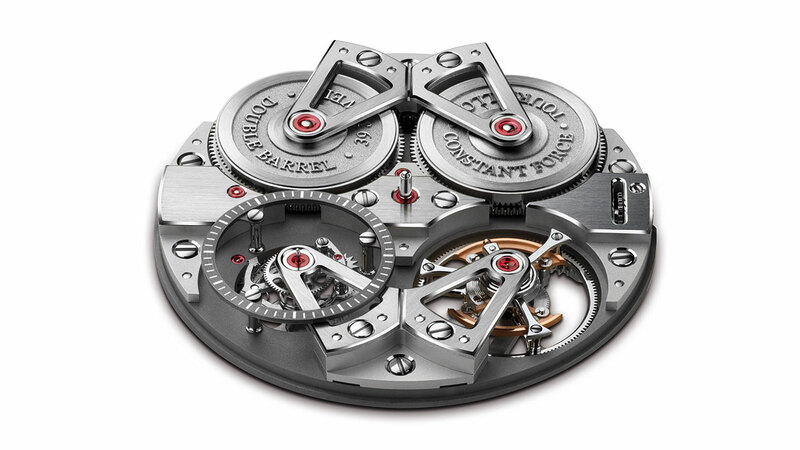 The former has two series-mounted barrels at 12 o'clock that ensure an optimal and regular flow of power to the tourbillon. The latter, which is clearly visible between 7 and 8 o'clock, stores energy from the balance via a spring, which it releases at each elapsed second only. The seconds hand therefore advances incrementally, allowing time to be read with greater ease and precision. 28-piece limited series. 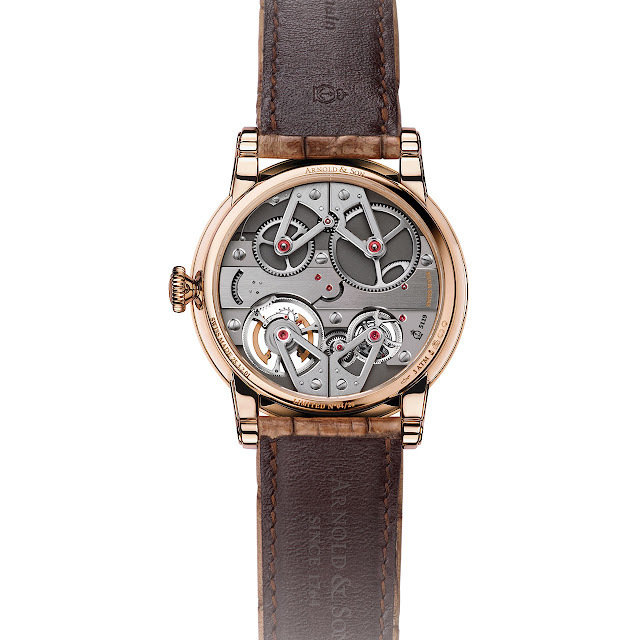 Mechanical hand-wound, A&S5119 manufacture calibre, 21,600 vib/h, 39 jewels, twin barrels, 90-hour power reserve. 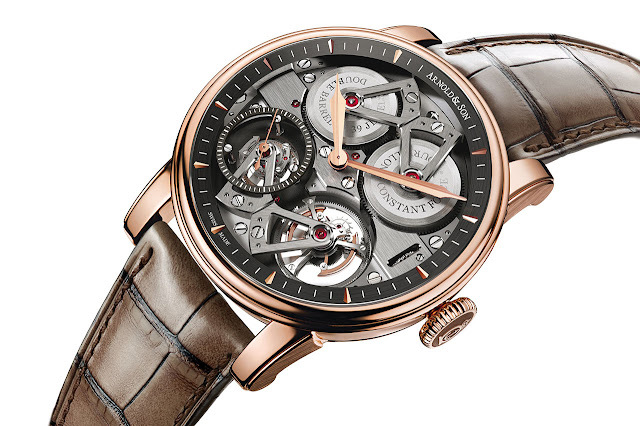 Hours, minutes, true beat seconds, tourbillon and constant force. Red gold 18K, 46 mm. Domed sapphire crystal with multi-layer anti-reflective coating on both sides, transparent back. Water-resistant to 30 metres (3 bar/100 ft). Visible movement with twin barrel at 12 o'clock, tourbillon between 4 and 5 o'clock, true beat seconds between 7 and 8 o'clock. Seconds counter and anthracite inner bezel ring with red gold appliques 18k. Patinated brown bottier alligator, hand-stitched with red gold folding clasp 18K.